Results of mast cell staining in early and recent studies agree surprisingly well, even though different staining methods have been applied. 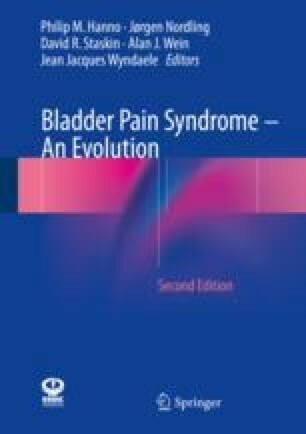 Increased mast cell counts in subepithelial tissue and in the detrusor muscle are characteristic for bladder pain syndrome/interstitial cystitis (BPS/IC) with Hunner’s lesion, or “classic interstitial cystitis”, but not for BPS/IC without Hunner’s lesion or overactive bladder syndrome (OAB). BPS/IC without Hunner’s lesion and OAB cannot be differentiated by mast cell counts, activation or localization. Recent studies found that mast cell evaluation is not necessary for the diagnosis of BPS/IC, especially because cystoscopy is sufficient to identify BPS/IC with Hunner’s lesion. Other histological markers, such as a defective urothelium, the presence of lymphocytic infiltration/lymphocyte aggregates and submucosal sensory hyperinnervation are better criteria to distinguish BPS/IC without Hunner’s lesion from OAB. The origin of BPS/IC still remains unknown. Future goals should include the identification of early disease forms and adequate therapies to prevent disease progression. Objective, reliable and preferentially non-invasive markers for diagnosis and treatment monitoring have to be determined.